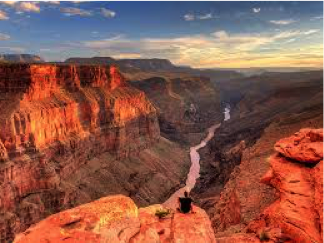 The first lecture I attended on Geology at Queensland University was delivered by Professor Bryan on the Grand Canyon. The landscape is geologically young, being carved within just the last 6 m.y. when the East Pacific Rise intercepted the coast of California and uplifted the Basin and Range blocks to form the Rockies. Three “Granite Gorges” in the bottom of the canyon expose crystalline rocks formed during the early-to-middle Proterozoic Era (late Precambrian). They were originally deposited as sediments and lava flows, and were intensely metamorphosed about 1,750 million years ago. Magma rose into the rocks, cooling and crystallising into granite, and welded the region to the North American continent. 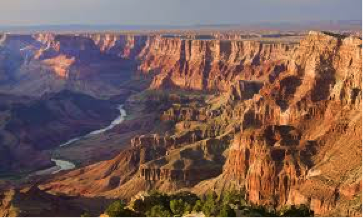 Rocks exposed in the Grand Canyon range in age from 1840 million years old (m.y), to 270 m.y. The 3,500 feet walls of sedimentary rock display a largely undisturbed cross section of the Earth’s crust extending back some two billion years. Vigorous cutting by the snow-fed Colorado River carved the Canyon and widening is held in check by the region’s dry climate. I visited the south rim of the Grand Canyon in 1996. I was aged 73 at the time and had a replaced left hip and two replaced knees. I started from the South Kaibab Trailhead down the Kaibab Trail with a stout walking staff. The steps were over one foot (30 cm) deep and I continued until I reached the terrace in the Tonto Group at a depth of about 3,000 feet. On the way I was passed by a train of mules carrying those who preferred to do their sight-seeing the easy way. 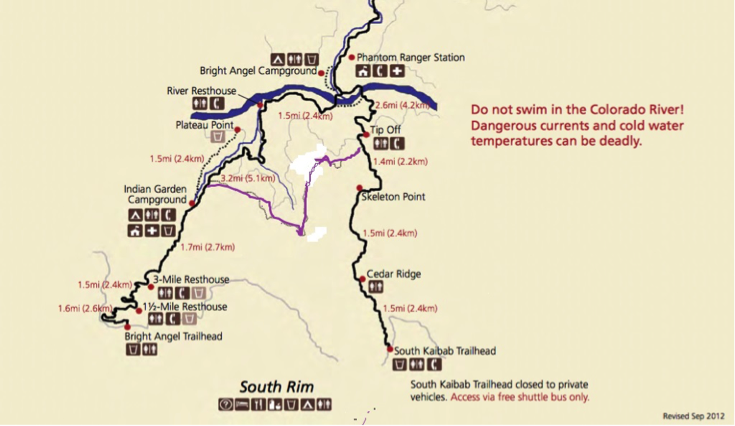 I turned left on to the loop trail (shown in purple on the sketch above) to take me across to Indian Gardens, another five miles and on this last stretch I ran out of water. When I arrived at Indian Gardens, I lay on a bench exhausted and dehydrated and Kath poured water over me and then had lunch. We climbed back up the Bright Angel Trail which is a fairly gentle climb on a path with no steps in the midst of a thunderstorm with hail the size of golf balls. I slept well that night..